Air cushion machines create void fills that are perfect for cushioning products from scrapes and bumps before storage or transit. There are different varieties of air cushion machines which are designed to fit different industry applications. Applications that require higher volumes of air filled cushions require heavy duty air fill machines. 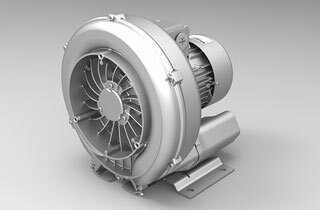 At Airtech Vacuum Incorporated, we have a variety of high pressure regenerative blowers. Our engineers work tirelessly to custom design air cushion machines to suit each client’s needs. We offer cost effective air cushion machines that consume less energy at unbeatable prices. Proper packaging is vital for busy production lines and businesses since it helps to protect products during storage or transits. Without proper packaging solutions at hand, a business stands to lose a lot in terms of breakages. Air filled cushions provide the best solution for products that require special packaging like fragile items. However, the packaging industry faces some challenges when it comes to minimizing the volume for packaged goods. At Airtech, we understand that businesses look for ways they can decrease their packaging volumes to allow them to cut down on transportation cost. Our engineers can custom design air cushion machines that are tailored to suit different industry applications. Our products offer fast packaging solutions and they are easy to operate. No matter the size of your production line, at Aitech, we have the right machine for you. Why Choose Airtech Vacuum Incorporated for Air Cushion Machines? At Airtech Vacuum incorporated, we are a renowned manufacturing company for high pressure regenerative blowers. Our company was established in 1982 and over the years, we continue to stay on top of our competitors by providing stellar vacuum and pressure equipment that are ISO9001-2008, UL-, CE-, RoHS-, and CSA-certified. We have a large client base and we partner with top manufacturing companies in the US, Asia and Europe to provide them with efficient blowers. Not only do our engineers custom design blowers for specific industrial applications but, we also stock ready to ship equipment. We have a team of friendly representatives who are always on standby to answer any queries our customers may have about our products. You can order our products online and we guarantee a fast turnaround to ensure that your business does not come to a standstill. We take cyber security very seriously and we ensure that all personal and purchase information is kept safe at all times. Browse through our inventory for air cushion machines and place your order for high pressure regenerative blowers today.